Is there a better alternative to Krypton? Is Krypton really the best app in Security category? Will Krypton work good on macOS 10.13.4? Krypton is a privacy tool that uses strong encryption (256-bit AES, CBC, HMAC-SHA256) to securely protect personal and confidential information resident on your computer. 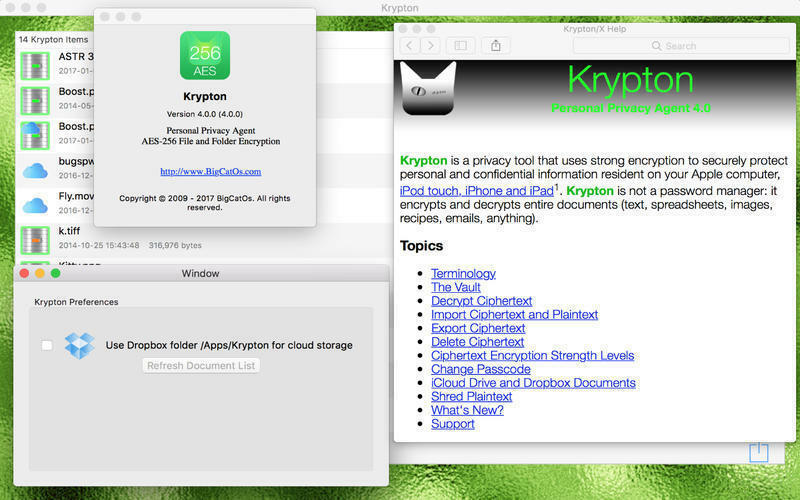 Krypton is not a password manager: it encrypts and decrypts entire documents (text, spreadsheets, images, recipes, emails, anything). Krypton needs a review. Be the first to review this app and get the discussion started! Krypton needs a rating. Be the first to rate this app and get the discussion started! Krypton keeps your ciphertext items in a special vault. When the App runs the vault opens automatically and all your ciphertext items are displayed. To encrypt a file or folder and add it to the vault simply use the File menu's Add To Vault menu item to select the item to encrypt. After that the passcode sheet slides down so that you can enter and verify your passcode, and optionally shred the original item. To decrypt a vault item, double-click it, and specify where to save the plaintext. After that the passcode sheet slides so that you can enter the decryption passcode.